great news great way to start the day! "The crowds and the supporters are fantastic," [Hersi] said. "They are so happy and they are enjoying watching us play so much, it just makes me so happy. "When I see how much they want us to win I just keep pushing and keep running because I can't let them down. I don't want to lose one game. "The people of Parramatta and Western Sydney are so amazing. It does not matter if you are rich or poor or Asian or African or white, you all just celebrate together and it is such a great thing. "I want to win something with the Wanderers if not this year then next year and beyond. I'm really happy about being able to see him in the red and black for another season. Today is a good day. Was thinking just the other day how much of a impact he makes and that we really need to re-sign him. 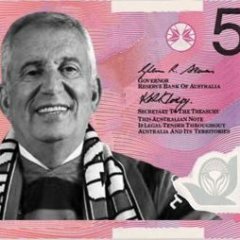 "The people of Parramatta and Western Sydney are so amazing. It does not matter if you are rich or poor or Asian or African or white, you all just celebrate together and it is such a great thing." Love it! Bringing everyone together. Western Sydney Wanderers livewire Youssouf Hersi admitted he'd contemplated returning overseas but was swayed to stick with the A-League club after a host of his teammates re-signed. The 30-year-old winger has been a revelation for the Wanderers in their debut season and will now be in the red and black strip for another year after extending his contract until the end of the 2013/14 season campaign. The Ethiopian-born Dutchman is hoping to build on his four goals and seven assists in what has been a remarkable year for the club. He was in blistering form again against Adelaide on Sunday scoring twice and setting up another to ensure the Wanderers remain in third spot just a point adrift of Melbourne Victory and only four away from table-toppers the Central Coast. 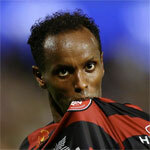 Hersi revealed he'd thought of returning overseas after receiving offers from European clubs, but instead decided to stay on with the Wanderers. "It was difficult because I wanted to go somewhere else, maybe," he said on Wednesday. "But I thought no, it's better to stay here, follow my heart." Part of that decision hinged on whether Hersi would continue playing with a team he's become comfortable with. "I said, if some players stay, I will stay as well." Hersi joins defenders Jerome Polenz, Michael Beauchamp, Adam D'Apuzzo, Shannon Cole, goalkeeper Ante Covic and midfielder Mateo Poljak who all re-singed with the club last month. A question mark still lingers over Japanese star Shinji Ono but Hersi's hopes are high the marquee man will follow suit. "I hope that he will stay as well for the next year. Let's hope he stays." The club is in discussions with Ono's representatives and coach Tony Popovic says they're "happy" with the progress. "We're very positive that the outcome will suit both parties," Popovic said. "We certainly want him here next year and we're confident that we can achieve that." Popovic shook off speculation that rival A-League and Chinese clubs were circling. "Good players are always linked to clubs, so we're actually quite pleased that he's doing that well that other clubs want him," he said. Hersi, who endured a knee reconstruction while playing in Holland and had not played a game since 2011, and admitted had it not been for the set-back he may never have ended up in Australia. "Before my injury I would (have never thought I would play in Australia)," he said. "After my injury maybe, but before, no." He says not only has he rediscovered his love for the sport but the injury forced him to re-think his attitude toward the game. "Before my injury...I don't (sic) have too much patience. All I was thinking about was to play as high as possible," he said. "After my injury I thought (in) a different way, I want to enjoy the football again and be happy and follow my heart...and that's (part of) making the decision to stay here as well." The Wanderers will attempt to post their fifth consecutive win when they host the Newcastle Jets on Saturday at Campbelltown Stadium. What a champion! I literally got goosebumps reading that statement, as much as you hope the players appreciate our efforts, It really floors you knowing how much they feed off this passion. Also great to have someone acknowledge the great people of the West, I love youusss all! Anyone see the photo hersi posted on fb and instagram? For those of us without facebook what did he do / say? That's a common story in Western Sydney. A club where the players represent the fans. One of our best players this season. What a champion, very happy he's signed on for next season. Sign him up for another 10 years, he can run around in his wheelchair for all I care, he'll still be running rings around the opposition defenders in the A-League!! thanks to him i'm 140 bucks richer. I wish i had put more money on him. So fun to watch. Love this player! We need a Hersi Song. Ha-be-sha Hersi, Ha-be-sha Hersi, Ha-be-sha Hersi, Hersi!! Habesha!! I spent 6 mths in Addis Ababa in 2010 (and visited Dire Dawa, Hersi hometown), habesha seems to be Ethiopian for authentic and very cool. I reckon he might appreciate that one...?? This guy smiles in every fan's photo he's in. According to @AndyHowe_statto Hersi set a record yesterday for the most consecutive wins by a player with 14. Breaking the previous record of 13 set by Matt Horsley back in 2001.
he's gonna be livid that he's missing the derby through suspension. A few of his yellows this year have been stupid to say the least. Hindsight is wonderful... spewing it cost him the derby! Considering he was being interviewed on his thoughts and how he was feeling about it..
Spewing Hersi is missing the derby though. Last time when Hersi was out for a game I saw him outside Coco Cubana eating before the match.